Meet Calamity (Pestilence), Raven (Famine), Clash (War) and Ghost (Death). They're the Four Horsies of the 'Pocalypse (or at least they would be if they could only get their act together)! This next-generation of doom bringers are on a mission to destroy the Earth, but to do so, they'll have to beat the likes of Queen Chroma and her rainbow sprite army! Led by Maddie (an older sister type with an affinity for destruction, available separately), these would-be Champions of Chaos are desperate to show their parents they've got what it takes to inherit the legacy. The Four Horsies 'Pocalypse Now Gift Packs are packaged together in a window-boxed. 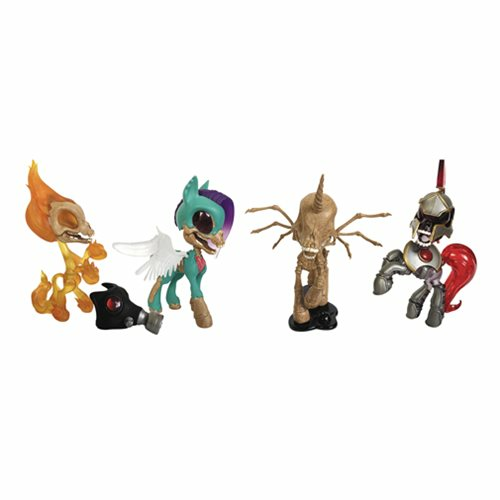 Each Horsie 4 1/2-inch tall articulated Four Horsies figures. Choose Original, Glow in the Dark or Spirit World Clear. Ages 15 and up.